The Kriging Extension is a highly effective tool for the removal of random acquisition noise from digital images. Its processing is based on Kriging analysis used in geostatistics. It was developed for imaging applications in a collaboration between the GeoSciences Research Group, a R&D laboratory at Mines ParisTech in France, and imaging software developer at ADCIS SA. Kriging methods, widely used in the field of oil exploration, are now successfully used in the field of imaging technology to enhance the quality of digital images. The Kriging noise removal method proceeds in three steps. First, an image variogram is generated. 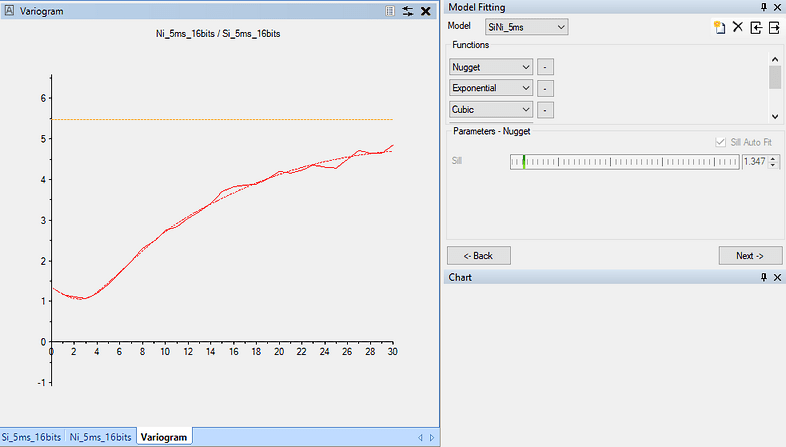 Next, a fitting model (function) is automatically computed by the software and is displayed graphically. The user can then interactively adjust the fitting model to better approximate the variogram. These adjustments are made with a linear combination of functions selected from a list provided in the Kriging Extension. Slider bars enable the user to fine-tune the selected functions to improve the model match to the computed variogram. Lastly, the Kriging process uses the fitting model to generate the noise-filtered image. Kriging Extension supports models for both isotropic and anisotropic variables, as well as single and multiple variables. For multivariate analysis, the selected model can be adjusted simultaneously to both the variograms and the covariograms. In the field of material science, the Kriging Extension can be used on each image corresponding to one trace element (i.e., stain, chrome, molybdenum, etc.). Use of this extension enabled the successful detection and quantization of trace elements on a stainless steel sample acquired with an electronic microprobe. It may also be used to filter another component of an image different from the background noise. The Kriging Extension is an optional extension of Aphelion™, fully integrated in the Aphelion Dev graphical user interface. The Kriging Extension supports models for both isotrope and anisotrope variables, as well as single and multiple variables. For multivariate analysis, the selected model can be adjusted simultaneously to both the variograms and the covariograms. In the field of material science, the Kriging Extension can be used on each image corresponding to one trace element (i.e., stain, chrome, molybdenum, etc.). Use of this extension enabled the successful detection and quantification of trace elements on a stainless steel sample acquired with an electronic microprobe. Feel free to contact us to get further information about the Kriging Extension. Link to the Aphelion Kriging Extension is available at the bottom of this page.